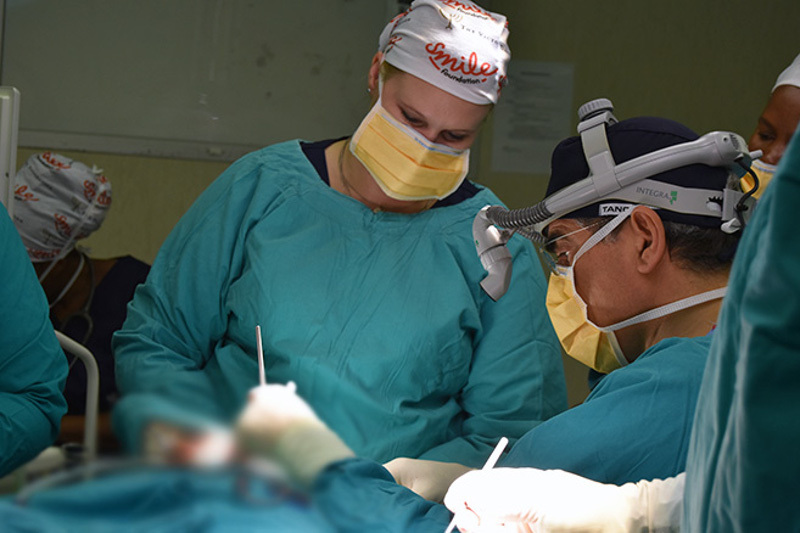 In a first for the province, UKZN’s Discipline of Plastic and Reconstructive Surgery joined forces with the Inkosi Albert Luthuli Central Hospital and the Smile Foundation to bring critical reconstructive surgery to children suffering from Moebius Syndrome (facial paralysis). This was done as part of the Smile Facial Reanimation Week held at Inkosi Albert Luthuli Central Hospital from 26 February to 1 March 2018. Professor Anil Madaree, Head of UKZN’s Department of Plastic and Reconstructive Surgery invited Dr George Psaras, the Medical Director of the Smile Foundation, to share his skills in this critical area of surgical procedures. Aside from this important transfer of skills to staff at the hospital, the initiative also aimed to upskill UKZN students. ‘This inaugural Smile Facial Reanimation Week created awareness in local communities about both Moebius Syndrome and the assistance families can obtain from the Smile Foundation and in future, this hospital.’ explained Moira Gerszt, Operations Executive Director of the Smile Foundation. Moebius Syndrome is a complex congenital neurological disorder that can affect multiple cranial nerves. When the 7th cranial nerve, called the facial nerve is affected there is paralysis of the muscles responsible for all facial movements. It is a rare disorder with an incidence of 1 in 50 000 of all live births in the USA. There are no statistics for South Africa. Due to its rarity, few surgeons are exposed to or have shown an interest in treating this condition. Psaras visited the Inkosi Albert Luthuli Central Hospital during the Smile Facial Reanimation Week to perform this complex procedure on two young patients, seven-year-old Boitumelo from Brakpan North, and eight-year-old Olwethu from Potchefstroom. Psaras also delivered lectures on the topic. Boitumelo and Olwethu underwent a successful surgery in the past week and are recovering well under high care. ‘While the surgery is not a high-risk procedure it took 8 to 12 hours to perform. The surgery required continuous precision and concentration for this period of time. It also required two teams of surgeons; one harvesting the gracilis muscle and another working on the face. Both girls are recovering well and smiling, we are all smiling,’ said Dr Psaras. The Smile Facial Reanimation Week was supported by The Victor Daitz Foundation. ‘On behalf of The Victor Daitz Foundation it is a privilege to commemorate our Founder by supporting children in the KwaZulu-Natal region with life-changing surgeries. This partnership will enable children to live their lives to their full potential and face the world with a positive self-image.’ says Brian Moshal, Managing Trustee of The Victor Daitz Foundation. ‘As always, we wish to thank our generous sponsors and all the people involved in contributing to this important initiative. Thank you to The Victor Daitz Foundation for the vital funding that made this week possible, and a special thank you to UKZN’s Principal Specialist, Dr Mahendra Daya, for his support in putting together this programme,’ said Gerszt. We’re About Putting Smiles on the Faces of Children in South Africa! Smile Foundation is a South African NGO that assists children with any type of facial or other conditions, to receive reconstructive surgery within South Africa. We help children who suffer from treatable facial anomalies such as cleft lip and palate, all burns, Moebius syndrome (facial paralysis) and other conditions. We are currently based in 11 Academic Hospitals around South Africa. We are investing in the medical teams we work with, through an Academic Skills programme, and we assist the hospitals by purchasing equipment for use by the Departments of Plastic and Reconstructive Surgery. “Our Chief Patron, the late honourable Nelson Mandela’s wish is for us to assist as many children around South Africa as possible to alleviate the stigma attached to living with a facial condition”. For more information, contact Smile Foundation on www.smilefoundation.co.za or 0861 276 453. Make a donation today! Help put a smile on a child’s face today! SMS “Smile” to 38413 to donate R10.